Video and Photos from Diagon Alley Preview event! Spoiler Alert! Check out some of the videos and images being shared on social media from Diagon alley! First off... the insane dragon fire! 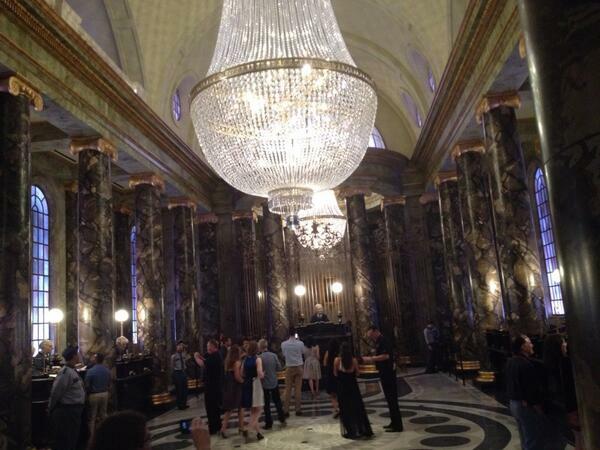 Re: Video and Photos from Diagon Alley Preview event! Spoiler Alert! The queue includes a scene similar to Disaster with physical sets with the transparent projection screen tech. The queue also has elevators with effects... think classic hyrolators! This place is amazing...UC has really stepped it up. My only real gripe is the dragon above gringotts doesn't move. Yes an outdoor animatronic of that scale in Florida would probably go disco dragon within months, but still...a little movement would have been nice. The first photo's and video's are amazing. Universal Creative appears to have spent their $300+ million budget well. It's almost like Comcast is miffed they did not get Disney and this is how they are going to get even. I have a dream. A dream to go to Universal next year. Stay onsite, and immerse myself in all things "Potter". The question is, "How much stuff/video/pictures/articles do I want to view in the meantime"? Thank you for the links, Flynnibus! He promised another one tomorrow. Did I hear American accents in Universal's England? Bad show. Give them group, one-hour English accent lessons for the dozen things they'll say the most often. Move the ones who can't do it. Audition future CM's (after a quick pronunciation video), and send the most English-sounding Americans to work in the Wizarding World of Harry Potter. I hope....we get stuff like this at the third park at Disneyland resort . . .
No way Universal will train hundreds of CM's how to speak a proper British dialect. I graduated from acting school, and it takes more then an hour video to get it right. I think in the end it would be much worse show to have people botching an accent as opposed to sounding the same and easily understood. If anything, they should just try to focus on clear diction. It looks absolutely amazing! I'm trying to go in September, and I was going to get 2 1/2 days at UNI and then run over for 2 days at WDW, but honestly now I'm thinking I'd rather spend the entire time a UNI so I have more time to explore this. it would be a lot cheaper too... UNI's ticket costs are almost trivial once you get past 2 days. Only $10 more per day on a 2 park ticket. I've been planning a once-in-a-lifetime visit to WDW, but from what I've seen of WWHP and Diagon Alley, I'm seriously considering going there instead. As much as I LOVE Disney, from what I'm seeing it puts Disney to shame. (Also having a number of friends tell me how much they absolutely HATED MagicBands and Fastpass+, plus the pain of having to plan your meals months out pretty much ruined their trip also has me rethinking WDW), But everyone I've talked to that has gone to Universal has had an incredible time. I don't know about cancelling your WDW plans, but I too want to take an all Universal trip. Do it up right. Stay in their hotel, and totally immerse myself in Potter stuff. Not knowing your constraints... but I wouldn't tell someone to 'do all or nothing'. I'd recommend paring back on something to allow you to do both. Currently, UNI is really only a 3 day diversion for most.. Diagon Alley tho really stands to change that. But if people are making a 'one in a lifetime' kind of trip you wouldn't want to spend just 3 days for that trip. Consider doing more than just UNI or just Disney. Don't blow your wad paying for an overpriced Disney Deluxe hotel... instead par down the # of days or where you stay, etc. Do both Universal & Walt Disney World, AlohaStitch. Learn to love MyMagic+. Please report back to us on your trip & have a great time. With 8-9 days in Central Florida, my plan is to spend 2.5 or 3 days at Universal and 5 or 5.5 days at Walt Disney World. The half day at Disney would let us do at least 3 FPs in the MK, and the half day at Universal would be worthwhile with the hotel's front-of-the-line pass. AhohaStitch, I love planning vacations and I ("pathetically" as I was called earlier today on Micechat) actually welcome the complexity making restaurant & attraction reservations so far in advance. The more intricate the system, the bigger advantage I'll have over the non-planners. That's where Micechat comes in--with all of the tips. For example, I'll avoid parks on days they'll have extended hours, because I've read that for most of the day they'll actually be less crowded, and though I like to plan holidays, once I'm there I'd prefer to not get up extra early--especially in that Eastern time zone. Of course, when we get there the attractions I most want to see that aren't at Disneyland and the best Harry Potter rides at Universal will probably all be closed, and then I'll have to fly out for a funeral.